Orthopedic magnetic resonance imaging (MRI) is a valuable tool that generates accurate, clear pictures of the soft tissue that surrounds bones and joints. MRIs enable physicians to clearly see tears and injuries to muscles, ligaments and blood vessels. They are frequently used to diagnose spinal conditions, joint problems, and sports and work-related injuries as well as tumors and other conditions. Many orthopedic conditions manifest primarily when the bones and joints bear weight and/or the patient assumes specific positions. As a result, traditional recumbent MRIs, in which patients are scanned while lying down—a position which places little or no strain on patients’ spine and joints, may not allow physicians to accurately diagnose injuries that cause patients pain during their daily activities. In particular, injuries that cause back pain might not be apparent on a recumbent MRI. Stand-up MRIs were designed to scan patients while they are standing, bending, leaning, sitting or moving. They enable physicians to view the spine and joints in a variety of positions. They are ideal for diagnosing flexion-extension injuries and spinal instability. 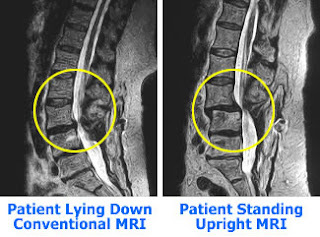 In particular, stand-up MRIs enable diagnosis of degenerative pathology of the spine in cases in which patients experience pain only when they are in an upright position and allow physicians to visualize occult spine pathologies associated with low back pain. A recent innovative study on whether carrying heavy backpacks can damage children’s backs used a stand-up MRI to examine how packs weighing 10%, 20% and 30% of kids’ body weight impacted spinal structures. The study demonstrated that back packs representing 20% or more of their body weight can cause compression of spinal discs and curvature of the lower spine in children. Stand-up MRIs are more spacious than traditional MRI machines, which may not be big enough for exceptionally large patients. They are also ideal for patients who experience claustrophobia or panic when lying within the enclosed space of a regular MRI. The added flexibility of stand-up MRIs makes them suitable for other orthopedic applications as well. For instance, using a stand-up MRI to diagnose and evaluate scoliosis enables patients to avoid repeated exposure to the X-ray radiation. It also allows children to be held by an adult while being scanned, eliminating or reducing the need for sedation.